The CSX family is fully-managed and can be operated in the ax chassis as well as in the single-slot housing. Inband management of remote units makes supervision and configuration very easy and comfortable. Together with the management infrastructure of the chassis, web-GUI, SNMP and ssh/telnet is available to integrate the devices into NOC. 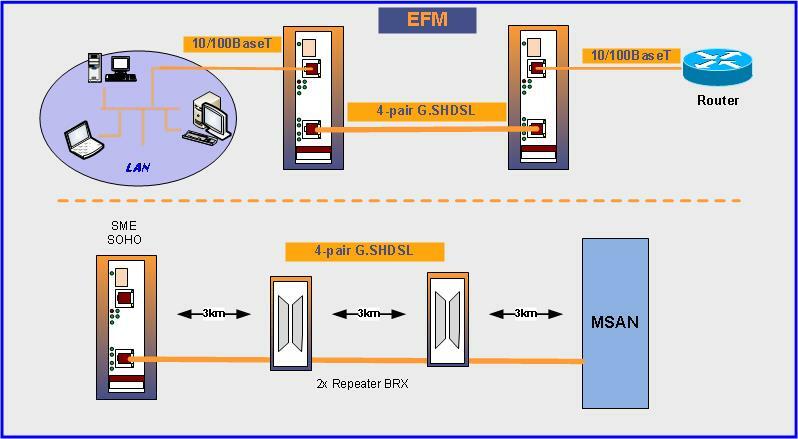 G.SHDSL is the best solution to quickly provide cost-effective, high speed network service for SME and SOHO users who need symmetrical connections, either Internet or legacy. By utilizing the existing telephony infrastructure, installation is simple and straightforward. With up to 20 Mbps full duplex speed IP telephony, web hosting and various broadband services can be easily provisioned.